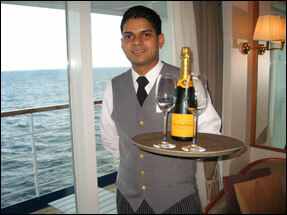 A personable cruise stewardess (cabin maid) is assigned to your suite for the duration of your cruise. In no time my stewardess Ariane (see photo) knew my preferences and always greeted me by name with a sincere smile whenever we passed in the hallway. And she always kept my suite clean, tidy and replenished. The 88 suites in the Penthouse Suite category and higher have butler service. Your smartly clad cruise butler enthusiastically performs services like securing restaurant reservations, making spa appointments, booking shore excursions, serving room service meals, unpacking and packing your suitcases, and any other special service you might request. My butler was Ryan (photo above shows him greeting me the first day with the traditional chilled bottle of quality champagne). He had a knack for anticipating my needs. The employees at the Reception desk were always willing and able to answer my questions. 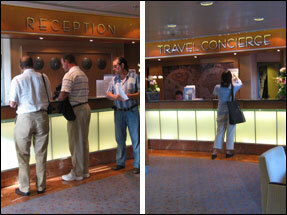 They also helpfully did tasks like exchanging foreign currency when the currency desk was closed.